On Wednesday April 25, 2012, Dwell Media celebrated its Light & Energy issue with a spectacular lighting exhibition and party held at Industria Superstudio. Dwell’s April issue looks at the latest innovations in energy conservation and lighting technology and singles out those leading the way. The designers featured in the exhibition included: David Weeks, Jason Miller, Bec Brittain, Lindsey Adelman, Rich Brilliant Willing, David Nosanchuk, Dror Benshetrit, Workstead, Chris Hardy for FontanaArte, Vica Design, FLOS, Artemide, Kartell, and Luceplan. The event was sponsored by Pharox, a San Francisco-based company creating cutting-edge LED lighting technology. 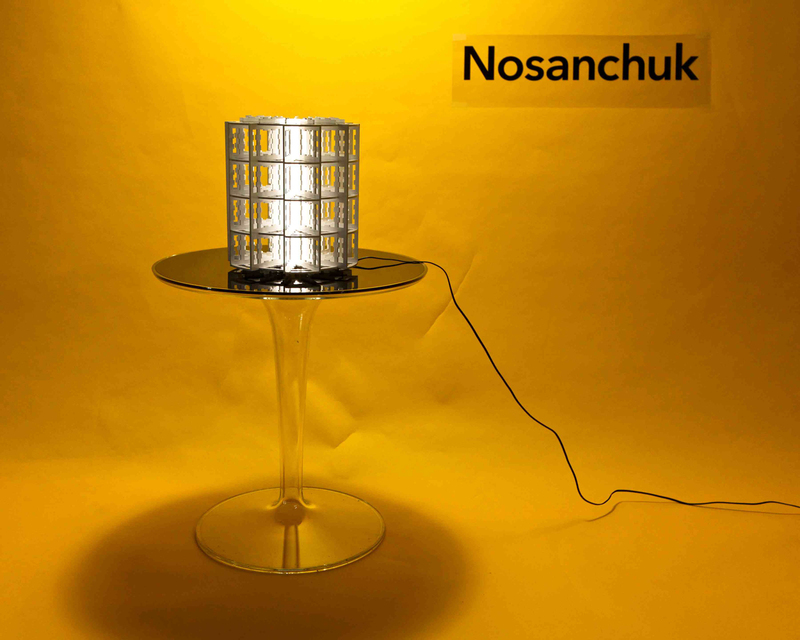 New York-based designer David Nosanchuk has created a new edition to his N1R series of custom table, floor, wall, and ceiling lamps. The lamps can be fabricated in an unlimited range of sizes (from ten inches to ten feet tall) for indoor and outdoor use in an a variety of materials including acrylic, metal, paper, and glass; illuminated by LED sources. Digitally fabricated, the linear expression of the lamps connects generative two-dimensional designs to the built product, defining a spatially complex form which is both scalable and scale less. David is currently rehabilitating a Gwathmey house in the Hamptons and has a new line of rugs out with Stark. Dwell invited 14 designers to display work at the backdrop to the Light & Energy event. The set design was by Tom Borgese, who created photo vignettes in yellow for each design, unifying and warming the room at Industria SuperStudio. Dwell favorite Lindsey Adelman contributed a stunning floor lamp in vintage brass with a grey globe and grey pod. Dror applied his QuaDror geometry to one flat, 3D, sls print of interlocking squares. When illuminated, the beauty of the complexity of the shape is highlighted through the various effects the light has on the hundreds of squares that make up the collapsible form. The light is diffused in a way that gives the structure a bright, warm glow in the center, which gradually fades into cooler, darker shades on the edges and corners of the cube. Roll & Hill founder Jason Miller refitted his Modo Lamp to take the Pharox 400xl bulbs, created a brilliant soft glow see across the room. The Modo Lamp is made of anodized aluminum and glass. Atlanta-based designer Chris Hardy showed off his Wig Lamp, which has been a best seller for FontanaArte. Hardy designed the lamp as a student in Hong Kong. He is currently working on a new product for DWR, we're excited to see his next creation. Perhaps the most iconic of David Weeks designs, the Hanging Mobile is custom-crafted to client specifications. With a minimum of two tiers, the Hanging Mobile can extend both horizontally and vertically, as far as the space will allow. Tiers balance effortlessly on an asymmetrical axis to allow gentle movement. This sleek luminaire designed by Karim Rashid for Artemide is made of hydroformed metal in polished black or white finish. A joint along the vertical lamp development allows a 350 ̊rotation adjusting the light emission and assuming different shapes in the space. Artist Joe Brittain and his wife ighting designer Bec Brittain with lighting designer Alexander Williams of Rich Brilliant Willing at Dwell's Light & Energy Party. Editor-in-Chief Amanda Dameron and Lemnis Lighting CEO Warner Philips. DJ Brendan Fallis spun tunes in the lounge featuring Kartell Masters Chairs by Philippe Starck. Tip Top side tables were also provided by Kartell for the exhibition. Designer Marc Thorpe illuminated by Bec Brittain's SHY Floor Light. The Bars were illuminated by Vica's battery-powered LED AG Lanterns. Voli Lyte Vodka was served, along with Peroni beer and Sneaky Pete's (for the health conscious). Bec Brittain presented her new SHY Floor lamp (left) and Dror Benshetrit his 3D printed QuaDror light (right), which folds flat and is currently on exhibition at Material ConneXion in New York. Rich Brilliant Willing and Workstead both displayed unique works utilizing the Pharox 400xl bulbs. LEDs are often thought of as tinted and harsh, but the combination of the Bright Side Lights and the Workstead floor lamp with the Pharox dimmable bulbs showed a softer side of LEDS. RBW's Bright Side Lights personifies a message of optimism through design and function. The cast glass pendants are durable, recyclable, and can be used as a hanging pendant lamp, or laid on their sides as a table lamp. Designed by architect Annabelle Selldorf for Vica Design, the Star Table Lamp base is made of oil-rubbed, blackened steel and the shade is made of onionskin paper. Also warmly lit by Pharox. Incredibly light but painstaking to assemble, Luceplan's Hope light proved to be worth every second, illuminating the room, and drawing many oohs and aahs as guests stared into the reflective plastic. A series of thin polycarbonate Fresnel lenses, created using imprinted microprisms on polycarbonate film to achieve a dioptric effect similar to glass,multiply the light from the light source, recreating a pleasant, glittery and party-like atmosphere. Hope – the fruit of a brilliant project and manufacturing process – has been designed for use with any type of light source and showed off the Pharox bulbs. The Brooklyn-based design duo Stefanie Brechbuehler and Robert Andrew Highsmith utilized a re-purposed O.C. White industrial joint and brass socket to create this unique floor lamp. The arm can be articulated in multiple axes; the joint allows for 360 degrees of rotation. The majority of lights were fitted with the Pharox LED light bulb, which filled the room with a beautiful ambient glow reminiscent of incandescent lighting. The Pharox also lasts up to 25 years, fits a standard socket, and uses 75% less energy than standard bulbs. Warner Philips, founder and CEO of Pharox, and serial cleantech entrepreneur shared some of the technological benefits of LEDs. Philips, a great-grandson of Anton Philips, founder of Philips Lighting, added "We are honored and proud to see Pharox featured in so many of these amazing fixtures from leading lighting designers. We promise consumers a bulb in the shape they trust with beautifully efficient light. The Dwell event beautifully illuminates our commitment to great design." The exhibition space was designed by Tom Borgese and featured bright yellow backdrops to 14 designs. DJ Brendan Fallis spun into the night, while guests enjoyed Voli Lyte Vodka, Sneaky Pete's and Peroni beer, and snacked on gourmet grilled cheese. Designers in attendance included: David Weeks, Jason Miller, Bec Brittain, Alexander Williams, Theo Richardson and Charles Brill from Rich Brilliant Willing, David Nosanchuk, Robert Andrew Highsmith and Stefanie Brechbuehler of Workstead and Chris Hardy. Brittain presented her new SHY floor lamp and Nosanchuk his new NIR Table lamp and Dror his 3D-printed QuaDror light currently on exhibit at Material ConneXion. Other guests included: Dwell Founder & Owner Lara Deam, Dwell Editor-in-Chief Amanda Dameron, and Publisher Brenda Saget Darling. Architects: Michael Arad, Marc Kushner, Jonathan Marvel, Charles Renfro. Pharox brings you the warm, beautiful light you’ve always loved, with unparalleled energy savings and a modern design sensibility backed by 6 generations of European tradition. Pharox has been at the forefront of the rapidly developing global LED lighting industry since 2006, selling over 5 million Pharox branded LED bulbs worldwide. In 2009, the company won the World Economic Forum’s Technology Pioneer Award and the World Bank’s Lighting Africa Award for its solar powered LED design. Pharox LEDs use 75% less energy than traditional bulbs (and last up to 25 years). They’re safe for you and your family and better for the planet. For images of the exhibition, view our slideshow.